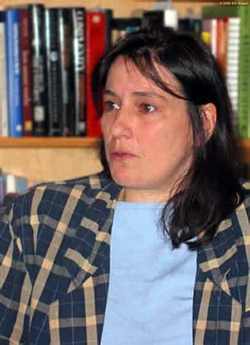 Dr. Anne Harrington, head of the Harvard Placebo Study Group which is trying to understand how placebos heal people. Photo courtesy of Fabulator.net. These gentlemen received underwent fake knee surgery and fully recovered from their knee problems. From the documentary Placebo: Cracking the Code. Why does the Self-Healing System pay attention to some problems and not to others? What makes the Self-Healing System work differently in different people? Can we find new ways to focus the Self-Healing System on specific areas? 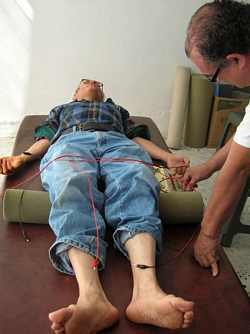 John Pint undergoing acupuncture in a Guadalajara clinic. “The needles tingle, but they don't hurt,” he reports. Montfort 36 is a popular homeopathic medicament for stomach and intestinal problems. Chemically, the small white “chochos” contain nothing but sugar and alcohol. Why are they so successful? Some years ago, on returning to Mexico after a very long flight from Oman, I contracted some kind of respiratory disease and got very sick. Doctors prescribed antibiotics and I took them while slipping deeper and deeper into a zombie-like state in which I could barely move. In my opinion, this was a dramatic example of my Self-Healing System at work, but by no means the only example in my life. Over many years I've seen my body heal fractured ribs, free me of frequent headaches and entirely eliminate salmonella bacteria which had been hiding for years in my spleen—unreachable by antibiotics. What I'm calling the Self-Healing System is usually referred to as the Immune System, but because it works 24 hours a day to repair just about any anomaly that comes along, I think the word “immune” doesn't do justice to this inner doctor's wide-ranging expertise. Recently, a team of doctors from Harvard University began a project to seriously study the organism's ability to heal itself. They were inspired to do this after witnessing dramatic clinical tests involving the placebo effect. In one such study, which took place in Houston, Texas, arthroscopic surgery was performed on people with a crippling knee problem. A second group of volunteers with precisely the same problem underwent a simulated operation in which cuts were made in their knees, but the cartilage-smoothing procedure required was not performed. To add realism to the simulated operation, a tape recording of the real procedure was played while the patient was under sedation. To the great surprise of Dr. Bruce Moseley of Baylor College Medicine, who performed the real operations and the simulations, the results inside the knees of both groups of patients were identical. The patients who had not been operated on were up and walking around just like those who had had the surgery—and their knees are pain-free even today. In Mexico, such studies have been ongoing for at least 165 years. The body's ability to heal itself is, in fact, at the very heart of homeopathic medicine, whose popularity among Mexicans is witnessed by the saying “Everybody uses it but the doctors.” In reality, the ingredients of homeopathic medicine are not designed to affect some part of the body chemically, the ways pharmaceuticals do, but simply to alert the Self-Healing System to a condition that needs attention. If the right homeopathic product has been chosen, the body then cures itself in the same way that it cured the knees of patients who had not been operated on in the Houston experiment. I think the same principle is behind acupuncture, a form of treatment which has been in continuous use for at least 2000 years. The acupuncturist inserts ultra-thin needles at key points in the body and twists them to produce a slight tingling, telling the Self-Healing System where to go to work. Once upon a time, while visiting my ailing mother in the USA, I tried to take her to an acupuncturist. To my surprise, the doctor told me by phone that “Wisconsin law allows acupuncture only for helping smokers kick their habit.” Thanks to the overpowering control of the American Medical Association (AMA) in the USA, only one of the various schools of medicine in the world is allowed to operate freely in that country, while all others are labeled quackery. Today, Mexico is a haven not only for acupuncturists, naturistas, biofeedback therapists and homeopaths, but also for proponents of cancer cures like Laetrile, who were driven across the border to escape the wrath of the AMA and the big pharmaceutical companies. Now, however, a respected team of researchers from Harvard are breaking the taboos and focusing on a subject to which every school of medicine should give top priority: how does the Self-Healing System work and how can doctors help it to do its job?